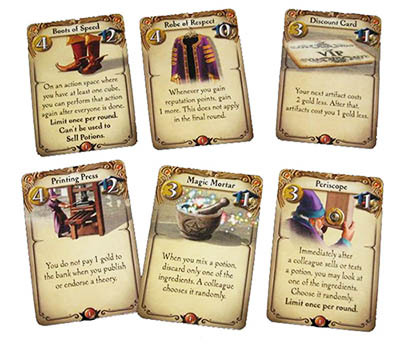 Special case: If you also have the Magic Mortar, a colleague will randomly choose 1 card to be set aside for Feather in Cap and the other will be returned to your hand. Once you know which card is returning to your hand, you can decide to not use the Magic Mortar and leave both cards set aside to be counted for Feather in Cap. During scoring, you should count this artifact first, while the scoring track still shows how many reputation points you had at the end of play. It gives you extra points for reputation only. The victory points you get from artifacts and grants have no effect on the value of Magic Mirror. Round down: 14 reputation points are worth two victory points from the Magic Mirror; 15 are worth three. Whenever you have to discard the ingredients you used in a potion, you ask another player to choose one of the two cards at random. Only the chosen card is discarded. You keep the other. This applies to the Sell Potion, Test on Student, Drink Potion, and Exhibit Potion actions. You use the Periscope immediately after you see the result, before the next player's action. The Periscope applies to the Sell Potion, Test on Student, Drink Potion, and Exhibit Potion actions. It does not apply to the Thinking Cap artifact. When you endorse a theory, you still must pay 1 gold piece to players whose seals are already there. But you don't pay a gold piece to the bank. This means you can publish new theories for free. Each gain of reputation is bigger by 1. For example, if you debunk a theory, instead of gaining 2 points, you gain 3. Special case: If you successfully debunk your own theory the Robe of Respect applies only if the result is a net gain in reputation (in other words, only if your seal was hedged against the color you used in debunking). If you suffer a net loss, the Robe of Respect does not apply. For publishing a new theory, you get 3 points instead of 1. For endorsing a theory, you get 2 points instead of 0. This bonus is cumulative with the Robe of Respect. If you have both, you get 4 points for publishing a new theory and 3 for endorsing a theory. Use the button. You have to show the results to your colleagues, as usual, but there is no penalty for mixing negative potions. You are not allowed to use the same card in both experiments. 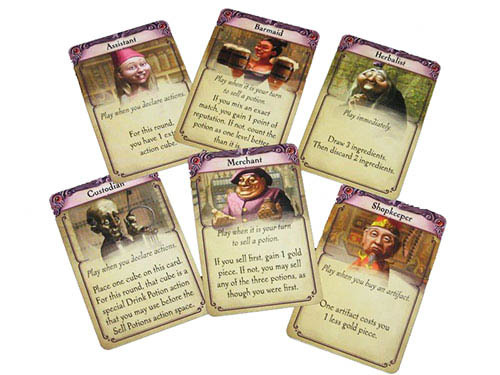 For example, if you want to test scorpion + toad and fern + toad, you need 2 toad cards. Wisdom Idol is not scored with the other artifacts. You use it after the Big Revelation. When scoring seals for correct theories, your seals score 1 extra point, whether they are starred or not. The Wisdom Idol does not apply to incorrect theories. You can still choose order spaces with ingredients; you just aren't allowed to draw the ingredient cards. You can still get ingredients from the Forage for Ingredient action or the Herbalist. Each favor card tells you when it can be played. You are allowed to play multiple favor cards at the same time. Their effects are cumulative, as explained below. Your faithful assistant is happy to run an errand so you can get a little more work done. In a 3- or 4-player game, you can find your extra action cube in the box. In a 2-player game (or a 3-player game in which you play 2 copies of this card at once) you can use an action cube in one of the unused colors. Don't forget to return the cube at the end of the round. The Assistant just gets you an extra cube for this round. You are still limited to the maximum number of actions allowed at each action space. "My associate and I would like to go first. Will that be a problem? No? Why, thank you". Because your cubes are in the top row, everyone who declares that action after you will have to put their cubes one row lower than usual. If someone else's cubes are already in the top row (because they played an Associate favor, too) move those cubes down to the second row and put yours in the top row. In other words, a player on a higher order space has a bigger, pushier associate than a player on a lower order space. On the Sell Potion action space, your Associate makes you first initially, but players still bid for the right to go first by offering discounts, as usual. (Of course, you win ties. Your Associate is good at breaking ties). If you play two Associate favors, you must use them on two different action spaces. She can find you a little something to give your potion an extra punch. For example, let's say you play the Barmaid favor and guarantee that you will mix a potion with the correct sign. If you mix , it counts as though you actually mixed . You will not lose reputation for mixing a neutral potion and you meet the terms of your guarantee. If you play 2 Barmaid favors and get a result of , the first favor makes it count as an exact match and the second favor gives you +1 reputation. It's nice to know someone who can let you into the lab early. When you play this card, place it next to the board, between the Transmute Ingredient and Sell Potion action spaces. It works like a Drink Potion action space at an earlier time. If you use 2 Custodian favors, you put 2 cubes there. The second card can go to the discard pile immediately because you need only one to serve as the action space. If someone else has already played their Custodian favor in that spot, use their card as the action space. Put your cube above theirs in the usual play order. Actions taken on this space do not count against the limit of 2 Drink Potion actions on the usual space. You can use the Custodian favor even in the final round, when Drink Potion is not available. When it is time to perform the action, you have the option to decline it. Once all actions on the card have been resolved, put it in the discard pile. She knows all the secret paths through the forest, and she always finds the best ingredients. You can discard any 2 ingredients. They don't have to be 2 of the 3 you have just drawn. This card must be played as soon as you draw it. If you draw 2 at once, resolve the first one, then resolve the second. His advice is free. Even better than free: It's profitable. Use a cube to block off the potion you sell, as usual, even if there is already a cube there. This might make it possible for every player to sell a potion. If you are not the first player and you play multiple Merchant favors, one favor essentially puts you in the same position as the first player and you get 1 gold piece for each of the rest. If you spend a bit of time talking with the shopkeeper, you'll discover that his prices are flexible. Playing more Shopkeeper favors gets you a bigger discount, but it is not possible to take the price below 0. The old alchemist has many secrets. One secret is just how much gold he can extract from a raven's feather. If you play 2 Sage favors, you get 3 gold pieces for one ingredient. This is obvious from the card, but we didn't want this venerable alchemist to be the only one without rulebook text.